The path to the crematoria. "Help prevent forest fires, smoking is forbidden"
"Articles 114, 115, 117, 118, 123, 124 and 153 of the Constitution are invalid until further notice. Restrictions on the freedom of the individual, the right to free speech, including freedom of the press and the right of assembly and the right to form groups, infringements on the secrecy of post, telegraph and telephone communications, house searches, confiscation and limitation in property ownership over and above the previously legally specified limitations are now permissible. "...Those who endanger human life by their opposition will be sentenced to penal servitude, or in extenuating circumstances to a term of imprisonment of not less than six months..."
Such restrictive politics would require innovative forms of incarceration. 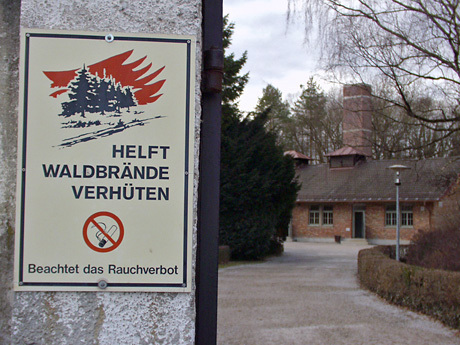 Less than two months after Hitler's taking power, on the 22nd March, the Dachau Concentration Camp was opened. "On Wednesday the first concentration camp is to be opened in Dachau with an accommodation for 5000 persons. All Communists and - where necessary - Reichsbanner and Social Democratic functionaries who endanger state security are to be concentrated here, as in the long run it is not possible to keep individual functionaries in the state prisons without overburdening these prisons, and on the other hand these people cannot be released because attempts have shown that they persist in their efforts to agitate and organize as soon as they are released. "...Police Chief Himmler further assured that protective custody is only to be enforced as long as necessary... The widespread rumors regarding the treatment of prisoners are shown to be inaccurate..."
Dachau was thus the first, the prototype, where the methodology of a society founded upon terror would be conceived, experimented upon, perfected and refined, prior to being exported to a network of camps throughout Europe. The inhumanity of the SS, the prison guards, the whole prison apparatus was conceived of as a methodology relying upon the laisser-faire granted to these people, pushing them to give free reign to express their personal barbarity. "Any person who at work, in the living quarters, kitchen workshops, toilets or rest places engages in subversive politics, holds provocative speeches, congregates with others for this purpose, forms cliques, loiters, collects or receives or buries information, repeats or smuggles out of the camp by means of a note or some other method to a camp visitor information, either true or false, concerning the camp, to be used in our enemies horror propaganda, or who sends written or verbal messages through released or transferred prisoners, conceals them in items of clothing or other objects, throws them over the wall, writes coded messages, or any person who in order to incite rebellion climbs onto the roof of the huts or up trees, or transmits signals with a lamp or by any other means, seeks outside contact, or advises, supports or aids others in escape or crime, will be hanged as a subversive instigator under the terms of the revolutionary law." Dachau was a machine for the extirpation of the human spirit, a slave camp where the enemies of the Reich were imprisoned and assassinated. Behind the veneer of "work" camp, where "Arbeit Macht Frei" - "Work Makes Free", it was a place where massive extermination was the final conclusion of a process of the planified destruction of the living being, the annihilation of the soul followed by the extinction of the body. Dachau represents the ultimate failure of all that is human, the forfeit of civilisation as the defining project of humankind.